My current car is the car I said I would never drive, a Volvo. It's a family car and I always said I would never have a family car. It's an XC90 and I love it. I think two children might have had something to do with that. At the moment it has a nail in the tyre so it's not going very far at the moment. I think it's a bit uncool maybe, however it's a beautiful car to drive. It's got seven seats and when you've got two little kids and grandparents coming to visit it's a very practical car and very safe. The older I get the more I'm into the practical side of things. My first car was actually my grandfather's car, so it was a Toyota Corona and it had racing stripes on the top and a dent in every panel on the vehicle. I'm convinced everyone thought I did it because it was my first car but my gorgeous pop had driven it into his 70s and he kind of hit a few things along the way. It went to my mum and eventually to my brother so it stayed in the family. It was a rust bucket by the time it retired but it had a good and long life. We always had a station wagon, which was very practical. We often used to sit in the back of the vehicle before it was against the law not to be belted up. The fabulous memories I have of the station wagon was going on family trips where the kids were in the back and we went to the beach. One was a very exotic purple colour and one was green. I always love sports cars. I had a (Toyota) Celica once, that was before children obviously. Something sporty and zippy. I like to zip around. I like smaller cars I can park very quickly and easily. I'm not a Ferrari girl or a Maserati girl but something just a little sporty. Born: 1966, in Babinda - far north Queensland. 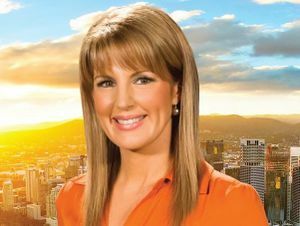 Fast fact: She graduated with a communications degree in 1986 at the Queensland University of Technology in Brisbane, the only journalism student in her year to graduate with a distinction. Current job: Weekend newsreader with Channel Seven.